This chic North Myrtle Beach resort is as beautiful as it is inviting. It is a large high-rise that curves like open arms extending to the Atlantic Ocean. It is a featured icon of the Ocean Drive section of North Myrtle Beach, South Carolina and it is a North Myrtle Beach resort that boasts many on-site amenities. Avista Resort is 16-stories tall and every North Myrtle Beach rental in this resort has ocean views. Most of the North Myrtle Beach condominiums at Avista Resort also enjoy pool deck views from their private balconies. Relaxing on the ocean view balconies is a must during your North Myrtle Beach vacation. Listen to the sounds of the sea and smell the salt in the air while enjoying your beach vacation in a North Myrtle Beach condo rental at Avista Resort. The stunning oceanfront pool deck at this North Myrtle Beach resort is full of water amenities and the lounge and swim areas have views of the Atlantic Ocean. A pair of sparkling blue swimming pools is separated by a shallow-water kiddie pool with a mushroom waterfall. There are a couple of hot tubs on the oceanfront and a long lazy river, too. You will find even more water amenities that are covered in Avista Resort. 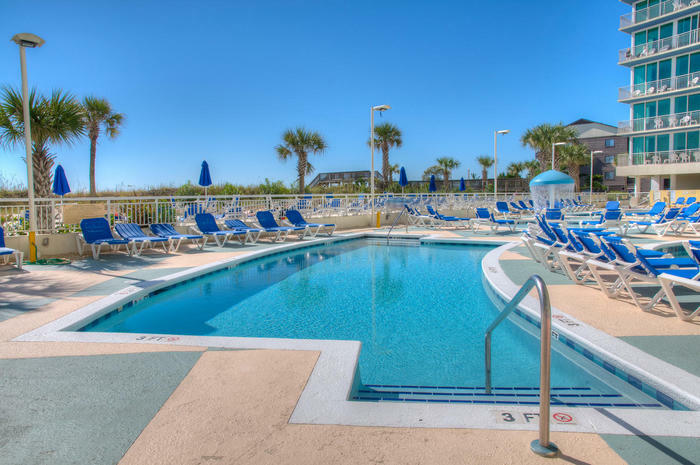 There is a lazy river, swimming pool and whirlpool so you can splash in the water while keeping out of the sun during your North Myrtle Beach vacation. There are so many North Myrtle Beach vacation rentals from which to choose at Avista Resort. Whether you need a little space or a lot of space for your family, friends and golf buddies, this North Myrtle Beach resort can accommodate you with ease. The three-bedroom, three-bath condos in North Myrtle Beach are beautifully suited for 10 or 12 people. There are charming one-bedroom, one-bath North Myrtle Beach rentals at Avista Resort that can sleep from four to eight people. And there is a middle size at this North Myrtle Beach resort, too. The two-bedroom, two-bath North Myrtle Beach condominium has room for eight or 10 people. Elliott Beach Rentals is not affiliated with onsite management or the HOA of Avista Resort.